BERKELEY, CA  Energy now lost as heat during the production of electricity could be harnessed through the use of silicon nanowires synthesized via a technique developed by researchers with the U.S. Department of Energy’s (DOE) Lawrence Berkeley National Laboratory (Berkeley Lab) and the University of California (UC) at Berkeley. The far-ranging potential applications of this technology include DOE’s hydrogen fuel cell-powered “Freedom CAR,” and personal power-jackets that could use heat from the human body to recharge cell-phones and other electronic devices. Rough silicon nanowires synthesized by Berkeley Lab researchers demonstrated high performance thermoelectric properties even at room temperature when connected between two suspended heating pads. In this illustration, one pad serves as the heat source (pink), the other as the sensor. “This is the first demonstration of high performance thermoelectric capability in silicon, an abundant semiconductor for which there already exists a multibillion dollar infrastructure for low-cost and high-yield processing and packaging,” said Arun Majumdar, a mechanical engineer and materials scientist with joint appointments at Berkeley Lab and UC Berkeley, who was one of the principal investigators behind this research. “We’ve shown that it’s possible to achieve a large enhancement of thermoelectric energy efficiency at room temperature in rough silicon nanowires that have been processed by wafer-scale electrochemical synthesis,” said chemist Peidong Yang, the other principal investigator behind this research, who also holds a joint Berkeley Lab and UC Berkeley appointment. Majumdar, who was recently appointed director of Berkeley Lab's Environmental Energy Technologies Division (EETD) and is a member of the Materials Sciences Division, is an expert on energy conversion and nanoscale science and engineering. Yang is a leading nanoscience authority with Berkeley Lab's Materials Sciences Division and with the UC Berkeley Chemistry Department. Majumdar and Yang are the co-authors of a paper appearing in the January 10, 2008 edition of the journal Nature, entitled “Enhanced Thermoelectric Performance of Rough Silicon Nanowires.” Also co-authoring this paper were Allon Hochbaum, Renkun Chen, Raul Diaz Delgado, Wenjie Liang, Erik Garnett and Mark Najarian. 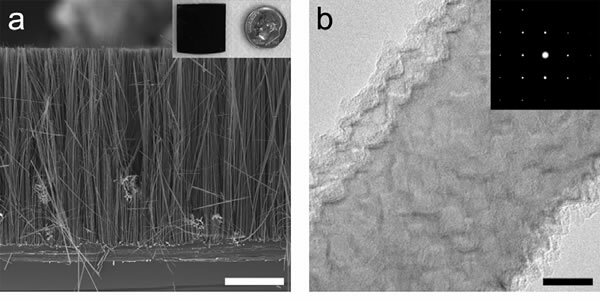 The Nature paper describes a unique “electroless etching” method by which arrays of silicon nanowires are synthesized in an aqueous solution on the surfaces of wafers that can measure dozens of square inches in area. The technique involves the galvanic displacement of silicon through the reduction of silver ions on a wafer’s surface. Unlike other synthesis techniques, which yield smooth-surfaced nanowires, this electroless etching method produces arrays of vertically aligned silicon nanowires that feature exceptionally rough surfaces. 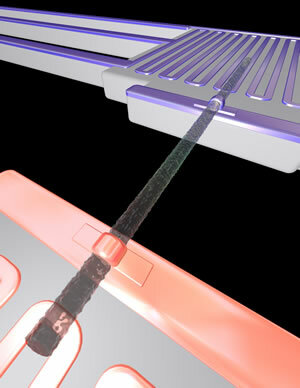 The roughness is believed to be critical to the surprisingly high thermoelectric efficiency of the silicon nanowires. Nearly all of the world’s electrical power, approximately 10 trillion Watts, is generated by heat engines, giant gas or steam-powered turbines that convert heat to mechanical energy, which is then converted to electricity. Much of this heat, however, is not converted but is instead released into the environment, approximately 15 trillion Watts. If even a small fraction of this lost heat could be converted to electricity, its impact on the energy situation would be enormous. From left, Renkun Chen, Arun Majumdar, Peidong Yang and Allon Hochbaum were co-authors of a Nature paper that described a wafer-scale electrochemical synthesis technique for producing rough silicon nanowires that can convert heat into electricity with surprisingly high efficiency. However the on-going challenge for scientists and engineers has been to make thermoelectric materials that are efficient enough to be practical. The goal is a value of 1.0 or more for a performance measurement called the “thermoelectric figure of merit” or ZT, which combines the electric and thermal conductivities of a material with its capacity to generate electricity from heat. Because these parameters are generally interdependent, attaining this goal has proven extremely difficult. In recent years, ZT values of one or more have been achieved in thin films and nanostructures made from the semiconductor bismuth telluride and its alloys, but such materials are expensive, difficult to work with, and do not lend themselves to large-scale energy conversions. The ability to dip a wafer into solution and grow on its surface a forest of vertically aligned nanowires that are consistent in size opens the door to the creation of thermoelectric modules which could be used in a wide variety of situations. For example, such modules could convert the heat from automotive exhaust into supplemental power for a Freedom CAR-type vehicle, or provide the electricity a conventional vehicle needs to run its radio, air conditioner, power windows, etc. When scaled up, thermoelectric modules could eventually be used in co-generating power with gas or steam turbines. Figure (a) is a cross-sectional scanning electron microscope image of an array of rough silicon nanowires with an inset showing a typical wafer chip of these wires. Figure (b) is a transmission electron microscope image of a segment of one of these wires in which the surface roughness can be clearly seen. The inset shows that the wire is single crystalline all along its length. The Berkeley Lab researchers will be studying the physics behind this phenomenon to better understand and possibly manipulate it for even further improvements. They will also concentrate on the design and fabrication of thermoelectric modules based on silicon nanowire arrays. Berkeley Lab’s Technology Transfer Department is now seeking industrial partners to further develop and commercialize this technology. This research was funded by the U.S. Department of Energy's Office of Basic Energy Science, through the Division of Materials Sciences and Engineering. Berkeley Lab is a U.S. Department of Energy national laboratory located in Berkeley, California. It conducts unclassified scientific research and is managed by the University of California. Visit our Website at www.lbl.gov.